South Korea based Hyundai Motor reported its smallest net profit for a quarter in the last five years, coming up short of expectations and warned that the second six months of 2017 would be difficult as sales will be hit by political headwinds in China and slow demand continues across the U.S. The automaker, which together with Kia Motors an affiliate is the No. 5 largest in the world, and has bet its earnings will recover slowly, but those plans came to a screeching halt with the backlash in China over the decision by Seoul to deploy its anti-missile system and showing no signs that will abate. 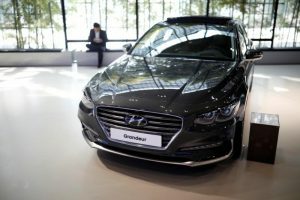 The U.S. is Hyundai’s second largest market behind just China, and demand is expected to continue to slow which is taking its toll, a trend the company cautioned would persist throughout the remainder of 2017 with its flagship Sonata sedan losing ground to SUVs that have become more popular. Choi Byung-chul the CFO at Hyundai said that the challenging environment should persist during the second six months of the year due to negative external issues like the U.S. slowdown and the issue with China. Early Wednesday, Hyundai Motor said its net profit during the second quarter halved compared to the same period last year to 817 billion won or $729.15 million the 14th consecutive drop year on year and the smallest since its 2012 first quarter. Analysts were expecting 1.35 trillion won. Operating profit was 1.34 trillion won while sales ended for the quarter at 24.31 trillion won. The company aims to shore its worldwide sales up through launching new models such as its small SUV the Kona and its sports sedan the Genesis G70, said the CFO. Hyundai’s China retail sales slumped 29% during the 2017 first six months. The weak brand image also has put Hyundai at a big disadvantage versus its local and global rivals like Honda, Toyota and General Motors, which all had higher sales in China during June. GM, during its earnings Tuesday, announced it had set a sales record for the second quarter in China. Hyundai Motor is planning to open a new plant during August in Chongqing hoping that will offset some drop in sales by entering the southwestern region, even though other plants are underutilized in the country’s eastern region. In the U.S., Hyundai Motor said its sales between January and the end of June dropped by 7.4%. The drop came despite the company sharply increasing its incentive to buoy sales.